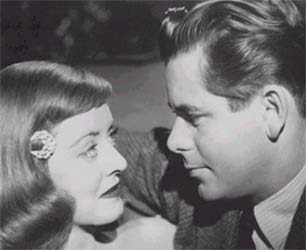 Kate (Davis) and her twin sister Patricia (also played by Davis) both fall for the charming Bill Emerson (Ford) while on a boat trip home to New England. Patricia steals Bill away from her sister, sending Kate into a deep depression. While Bill is away on a trip, Kate and Patricia are involved in a sailing accident. Patricia is drowned, but Kate washes ashore alive. She is mistaken for Patricia, which allows her to steal back the man of her dreams. What do you say? 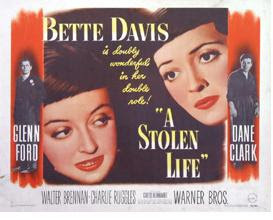 Bette Davis pretends to be her twin sister, Bette Davis, and steals a man from her? And one of the Bette Davises is involved in a fatal accident? And I can't get this from Netflix??? So, most of the movie was fun. Silly, but fun. Oh, but the ending. Eek. I went with Barbara, and as it was a few months ago now, I can't remember exactly what we said to each other when the movie finally ended, but I'm sure it involved eye rolling and laughter, and maybe some "What?!?"s. One star for the wonderful special effects of having two Bette Davises lounging on the bed together talking men. So that makes...one star. I would recommend seeing it once, but not more than once! You might have to tell me the ending.